Shalmaneser V (Akkadian: Šulmanu-ašarid; Template:Hebrew name; Template:Lang-el Salamanassar; Template:Lang-la) was king of Assyria from 727 to 722 BC. He first appears as governor of Zimirra in Phoenicia in the reign of his father, Tiglath-Pileser III. Evidence pertaining to his reign is scarce. On the death of Tiglath-Pileser, he succeeded to the throne of Assyria on the 25th day of Tebet 727 BC, and changed his original name of Ululayu to the Akkadian name he is known by. While it has been suggested that he continued to use Ululayu for his throne name as king of Babylonia, this has not been found in any authentic official sources. 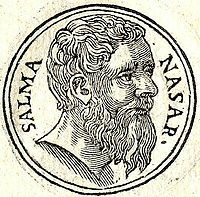 The name Shalmaneser is used for him in the Bible, which attributes to him the final conquest of the kingdom of Samaria (Israel) and the deportation of Israelites. According to 2 Kings, chapters Template:Bibleverse-nb-Template:Bibleverse-nb, Shalmaneser accused Hoshea, King of Israel, of conspiring against him by sending messages to Pharaoh Osorkon IV of Egypt, and captured him. The Egyptians attempted to gain a foothold in Israel, then held largely by Assyria's vassal kings, by stirring them to revolt against Assyria and lending them some military support. After three years of siege he took the city of Samaria. The populations he deported to various lands of the empire, (together with ones deported about ten years earlier by Tiglath-Pileser III) are known as the "Ten Lost Tribes" of Israel. The populations he settled in Samaria instead form the origins of the Samaritans, according to a commentary in the Bible. Shalmaneser died in the same year, 722 BC, and it is possible that the population exchanges were done by his successor Sargon II. In the book of Tobit, chapter 1, the exiled Tobit is shown finding favor in Shalmaneser's court, only to lose influence under Sennacherib. ↑ Sayce, Archibald Henry (1911). "Shalmaneser". In Chisholm, Hugh. Encyclopædia Britannica. 24 (11th ed.). Cambridge University Press. p. 798. ↑ G. Frame, Babylonia 689-627 B.C., p. 303-304. ↑ Roux, Georges (1992). Ancient Iraq (Third ed.). Penguin. pp. 310–312. ISBN 9780140125238.